The topic of drone strikes has been a hot item for Hollywood recently, as the practice becomes more prevalent and we receive more information on what is happening behind closed doors. Or should I say, what it happening within metal modules in Las Vegas where American pilots fly robots through the air thousands of miles away, dropping bombs on the heads of unsuspecting terrorists. We could get into a moral debate over the ethics of this unseen war and the questions it raises, but today we’re here to talk about a movie, one that puts its own spin on the problem. 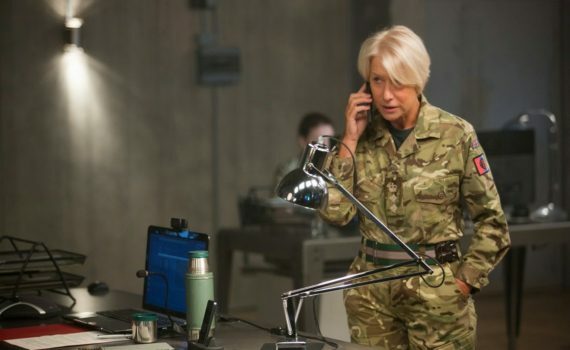 Eye in the Sky is much less a complete film than Good Kill, a comparable movie of the same genre, but it does heighten our awareness to a blossoming complication, something that shouldn’t be overlooked. British Colonel Katherine Powell has been hunting a UK citizen turned terror suspect for six years, and has finally tracked her down. She, her husband, and a group of recruits are meeting together at a location that has been pinpointed by Kenyan spies, and an opportunity to take them down will never come along so neatly wrapped as this one. So, Powell, along with high officials of the English government and an American drone task force, embark upon a top secret mission to capture the terrorists and bring them to justice. A snag in the plan presents a major problem, and the capture scenario changes quickly to a kill scenario, something that needs approval from many branches and ministers. But time is of the essence, as the terrorists may leave at any moment, and a hellfire missile may be too late to rid the world of this potential threat. There’s more to the story; debates about what is a justified amount of death, collateral damage, who has the authority to call the shots, just how many individuals and groups are involved in the mission. It’s a complicated theme, and I can only imagine that this is the way these things work; tough decisions in which no outcome is beautiful. The horrors of war are on full display here, if on a smaller scale, which doesn’t decrease the importance of at least being aware that the murders we don’t see are no less horrible than the ones we do. So it’s a fascinating subject, but the film itself isn’t quite as strong. Mirren is awful as an overly-excited colonel, Rickman seems to have phoned his performance in, and Paul just isn’t a high-caliber actor. The side roles are silly as well, and so no one will be giving this movie awards for acting or directing any time soon. That doesn’t mean that it’s worthless, far from it, the story is one that perhaps we need to hear. But don’t look for top quality, just use the film as a springboard for conversation instead.